A Real Estate Power of Attorney is used to designate another individual to manage, acquire, mortgage (refinance), convey, or to sell as an agent (real estate broker/realtor) on behalf of the principal. The form may be used in a durable manner which means that if the person that is delegating the power, the ‘principal’, becomes in a vegetative state (incapacitated) then the attorney-in-fact selected is still able to carry out their duties. What is a Real Estate Power of Attorney? It’s a document that enables an owner of real estate the ability to authorize another individual (known as an Agent) to perform a wide range of assignments on behalf of the Principal’s real estate. A Real Estate Power of Attorney can be tailored to allow the Agent to handle the Sale, Purchase, Management, Closing, or Refinancing of a Property. A Real Estate Power of Attorney can be used to give powers for single or multiple real estate transactions. A Real Estate Power of Attorney is also very useful when needing someone to manage your property. This could include signing lease agreements, negotiating rents, evicting tenants etc. As an example, a property owner could hire a property management company to rent out the property and keep up with the day-to-day maintenance. In doing so, the property owner would need to sign over a Real Estate Power of Attorney giving the property management company managing powers. Our Real Estate Power of Attorney has 3 different ways to go about setting the term. Typically if your Real Estate Power of Attorney is intended for a single transaction, you would not want the term of the agreement to last indefinitely, therefore you would select a beginning and end date. If you do not want the Real Estate Power of Attorney to be “Durable”, meaning that upon incapacitation, death, or revocation, your Real Estate Power of Attorney would be void, you have that option. Lastly, the 3rd option allows you to set the term indefinitely and it will only terminate upon death or revocation. Once complete, your Real Estate Power of Attorney must be signed by both yourself and the agent. It varies state by state as to the Witness and Notary requirements but the safest way to go is to have 2 witnesses and a Notary sign your Real Estate Power of Attorney. Make sure you are familiar with the computer you are using. Three caption buttons have been provided on this page with the preview image so that you may choose a file type compatible with the programs on your machine. Download this template as in any of these formats. If you have a computer program capable of editing a Word, PDF, or ODT file then, you may supply the preliminary information on-screen before turning it over to the Principal for approval and execution. As mentioned earlier, this document will need to be supplied with some preliminary material. Such information will be focused on identifying both parties (Principal and Attorney-in-Fact) and naming each as such. This task may be achieved easily by supplying the relevant information where requested in the introductory statement. The first individual we will seek to identify will be the Principal. That is, the individual giving the Attorney-in-Fact the right to wield Authority in his or her Name concerning Real Property. To fully identify this individual in this role, produce a report consisting of his or her Full Name, Residential Street Address, City, and State using the first four blank spaces in this statement (in this order). Each of these elements will have its own individual blank space. This statement shall continue with the identity of the Attorney-in-Fact. In the next portion of this statement, we shall use the blank spaces after the words “Hereby Appoint” to name an individual to this role. This task will be accomplished by supplying the Full Name, Residential Street Address, City, and State of the Attorney-in-Fact where these items are requested. Make sure this is accurately presented so the Attorney-in-Fact can be identified as such when wielding Principal Authority. The exact Principal Authority the Attorney-in-Fact can wield with Real Property in the Principal’s Name will have to be meticulously detailed. This can be done with some standardized (and necessary) wording which is presented in “Article I. 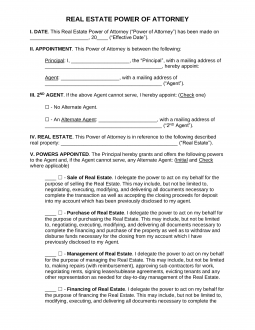 Assignment Of Authority.” This section presents a list with each type of Real Estate Authority the Principal may place in the scope of the Attorney-in-Fact’s Principal Powers. To approve an Agent’s use of a type of Real Estate Authority, he or she will have to supply several items (the Physical Address of the Property, the Legal Description of the Property, and his or her initials). The Physical Address and Legal Description may be furnished to the appropriate paragraphs by the preparer of this document but only the Principal can initial the blank space preceding the label to approve that Principal Power’s use for the Attorney-in-Fact. The Principal should read through this section then provide his or her initials to each completed paragraph that he or she approves. If a statement does not define any actions the Principal wishes the Attorney-in-Fact to take on his or her behalf, then he or she should leave that statement unmarked. The first type of Principal Power discussed is the “Sale Of Real Estate.” This will allow the Attorney-in-Fact to handle actions such as setting a price, negotiating a sale, handling the paperwork to execute that sale, along with a host of other actions that must be performed when the selling of Real Property occurs. To attach this Principal Power will be delivered to the Attorney-in-Fact when the Property’s Physical Address and Legal Address is supplied to it. In addition, the Principal will have to initial the blank line preceding the label and mark the checkbox provided. The Principal’s ability to buy Property will be discussed and described in the second paragraph item “Purchase Of Real Estate”). The Address where this Property is located must be supplied on the blank space following the terminology “…Premises Located At” while its Legal Description should be furnished to the empty line after the phrase “…A Legal Description Of.” The Principal will also have to place his or her initials on the blank space attached to the label in bold letters to include this in the Principal Powers given to the Agent. Finally, the Principal must mark the checkbox to finalize this approval. The third type of Principal Power discussed will concern Property Management. If the Principal requires the Attorney-in-Fact to perform tasks regarding the Leasing, Maintenance, and developing Lease or Sub-Lease Agreements, the Property’s Physical Address along with its Legal Description should be supplied to the text making up this paragraph and the Principal should initial the bold label “Management Of Real Estate” then mark the attached checkbox. Actions concerning the “Refinancing” of a Property in the Principal’s Name will be considered part of the Attorney-in-Fact’s Principal Powers through the terminology presented in the fourth paragraph. The Physical Address and Legal Description where the Attorney-in-Fact may handle the paperwork and executions involving its debt should be supplied to the two blank lines in this paragraph. To approve the Attorney-in-Fact’s use of this Power, the Principal will have to initial this paragraph and mark the checkbox. The Principal will also need to make sure that a detailed report describing when the Attorney-in-Fact is allowed to wield Principal Power is furnished to this paperwork. This report can be produced with the Principal’s attention in “Article III. Term.” The Principal will only need to initial the statement that he or she wishes applied as a definition of this document’s Period of Effect. The first statement will define the Start Date as this paperwork’s Signature Date and will contain three blank spaces where the Principal may record a predetermined Date of Termination. If the Principal wishes this statement to apply, then he or she must initial this statement and mark the checkbox preceding it. The second option available for Principal approval is statement “B” where the Principal can set the Termination Date as the Date he or she is incapacitated or dies. He or she must initial the blank space attached to this sentence and mark the checkbox provided. The third choice shall consider the Principal Powers delivered here to remain in effect until the Principal dies or he or she issues a revocation. If the Principal wishes this choice to apply he or she must initial the blank line and mark the checkbox attached to statement C. In “Article V. Governing Law,” record the State where this document will be effective on the blank space presented in it. This document will only be considered a valid representation of the Principal’s wishes if he or she signs it. “Article VI. Revocation” will supply an area where this task should be performed. The statement “In Witness Whereof…” shall present a convenient method for the Principal to record the Signature Date for this document. He or she should supply the Signature Date’s Calendar Day, Month, and Year across the three blank spaces within it. Below the Signature Date, the Principal must sign and print his Name on the lines “Principal’s Signature” and “Print Name.” Next, the Attorney-in-Fact must sign the “Agent’s Signature” line and print his or her Name on the adjacent space. The next two areas “Affirmation By Witness 1” and “Affirmation By Witness 2” present a defined area where each Witness may supply a signed Testimony to the Principal Signing. Make sure each of these sections contains the Name of a unique Witness on the first blank line in this testimonial. Each Witness must then sign and print his or her Name in the spaces provided. This document should then be placed under the control of the Notary Public present at the time of the Principal/Witness Signing so that he or she may notarize it as required. The last section, “Acceptance By Agent” must be signed by the Attorney-in-Fact. After signing his or her Name, the Attorney-in-Fact should also print his or her Name.